Back when I was still participating in wrestling camp, a crew was filming a documentary about one of my trainers, Eddie Sharkey, and about a few other wrestlers in the Minneapolis area. I had forgotten about this, but I just stumbled across it recently. You can see excerpts of the short film and hear audio clips at the documentary site. It doesn’t look like the film is available for sale or rent, unfortunately. The film is called The Minneapolis Wrestling Club. 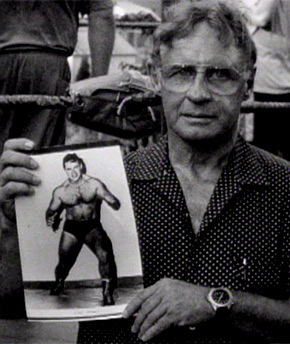 You can find an audio clip of Sharkey on their site, where he talks about Harley Race and himself getting in a fight with a couple of people from the crowd in Denver, CO.
Eddie Sharkey wrestled from the early 1960s to 1972. He retired and stayed out of wrestling for a number of years. Eventually he was lured back into the business by some younger wrestlers who asked if he would train them. These wrestlers – Jesse Ventura and the Road Warriors – eventually went on to some success. Sharkey still runs a wrestling school in the Twin Cities and referees matches throughout the Upper Midwest [at the time the documentary was filmed]. There is also a short video clip of Sharkey available in the excerpts (QuickTime). In the background you can see me wrestling Terry Fox in our training ring. The referee was “Rough Rod”. Over on the far right of the screen you can see Scott Free and Hellraiser Gutz (who is currently in the WWE as Bam Neely) standing on the apron. The second part of the clip shows a battle royal. If you don’t blink, you can see me for a few frames wrestling in a black tank top. Eddie is the ref in that match. Also part of the documentary is a profile of “Sodbuster” Kenny Jay. I wrestled Kenny twice. The first time I wrestled him he was 63 years old (that is not a typo). That was back in 1999. Wayne McCarty has pictures on his blog of Kenny wrestling in June of 2008! Do the math on that one!